When you’re a kid, there’s an endless list of things you’re not supposed to eat, and that includes bubbles. But apparently the science of bubble solution has come a long way over the years, because a company called Little Kids, Inc. has succeeded in concocting bubbles you can not only eat, but are actually surprisingly tasty. You’d assume that any bubble, whether it came from a wand, a bathtub, or a dishwasher, would taste like soap. But the Candylicious Bubbles genuinely taste sweet and more than live up to their self-explanatory name. In a blind taste test, that didn’t involve you awkwardly trying to grab a bubble out of the air with your mouth, you’d even be able to distinguish between the Candylicious Bubbles’ cherry, grape, bubble gum, and tutti frutti flavors. 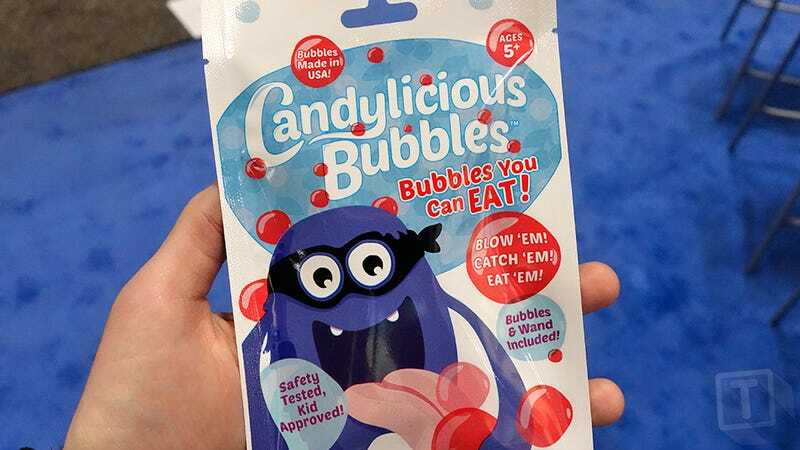 Available in 20ml pouches for as cheap as $2.99, or bundled with a $13 bubble blowing machine that serves up a near-endless smorgasbord of edible floating spheres, the Candylicious Bubbles are finally the answer to mankind’s most asked question: what has science ever done for me?